Carey Mulligan has been doing some promotions for her new film 'Wildlife' and on Monday(October 15th) she stopped by the Build Series in New York to discuss it. 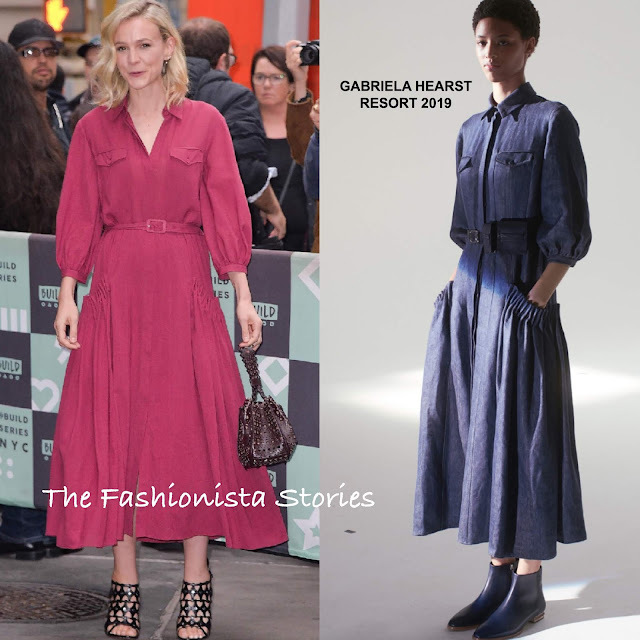 For her appearance, she wore the GABRIELA HEARST RESORT 2019 'Woodward' magenta shirt collar dress, featuring ballon inspired, three-quarter sleeves, a belted waist and pocket details. While I like the denim in the look book, I prefer the magenta hue for Carey. Acessorized with an AZZEDINE ALAIA bag & heels, she finished up with a matching lip.